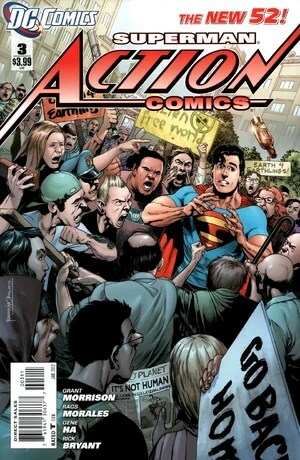 Action Comics from the New 52 has given us a more human Superman. A young 20 something hands on guy who seems to be looking for trouble and is over enthusiastic. This superman does not yet fully understand the responsibilities of being Superman as his powers are just building up. He doesn’t yet fly. He jumps off buildings and is a bit wayward. Grant Morrison has given us a Superman who is a bit more realistic. He is not Superboy, but neither is he the modern day Superman who can take on apocalyptic situations and beat them to pulp. We have something in between. A lost Superman trying to understand his role and discovering his powers. Issue 3 has a brilliant prologue of the happenings on Krypton before it got destroyed. Jor-El contacts Lara and informs her that Krypton is about to be devastated and that she must leave Kandor with baby Kal-El. The planet is then destroyed when an alien ship is seen hovering over it. I really like the way Krypton has been portrayed. Brilliant Pencilling and colours in the double spread showing the destruction of Krypton in the beginning. Let me be honest here about something. In all the issues of Action Comics that have come out, Clarke Kent looks like a frustrated drunkard. Its just my opinion. He looks absolutely beat up. As if someone sucked his soul and left an anorexic body behind. In contrast, Superman looks really nice. I don’t know why there has to be such a vast difference? Its too jarring for me atleast. There is a lot of propaganda against Superman by Glen Glenmorgan and Clarke is threatened to stop sympathising with Superman in his articles in the Daily Star. This is where things get interesting and at the same time go haywire. The story goes all over the place. The dialogues are better but as I said before, there is a problem with the art. It looks a bit unpolished in one scene and is a masterpiece in the second. Issue 3 builds up to the Debut of Steel and John Corben is seen lending Supes a hand. Issue 4 is nicely packed with action. Lex Luthor is seen afraid and running for his life. 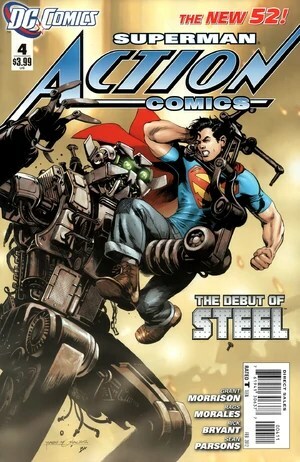 Superman is seen fighting robots. But when you read this issue, you get a ‘this feels like terminator’ feel to it simply because of the way machines all over the world are coming alive wanted to destroy humans and the planet because of virus and yada yada yada, you get the drift. The art work is so much better than the last 3. All expressions are perfect and there is a scene where a giant robot blasts Superman which I particularly liked. In the fight scenes that ensue between John Henry Irons and Superman, his weaknesses are again exposed. This book moves at breakneck speed. Plus, the next two issues, that is 5 and 6 will contain different stories. Being left with a cliffhanger and knowing that this will be continued only after 2 months is very annoying and i hope that its worth the long wait. Because its been very inconsistent up until now and I hope that the team gives us a spectacular issue 7 to continue the story up until now. Heres hoping No. 5 and 6 will be something different and something better to look forward to.